The Parenting Education Symposia are designed to be active, engaging forums where participants discuss, share, and collaborate in order to advance the work of parent and family education. The 2019 Symposium focuses our attention on trauma that impacts children and families. In particular, we will be learning about homelessness and how it impacts children and families. Ending homelessness and its negative impact on children and families requires collaboration and a knowledgeable, skilled workforce. The available resources for ending homelessness must be used in the most efficient and impactful way possible. We must understand the needs of families experiencing homelessness and make connections to resources that best meet those needs (from Heading Home Together plan). Person-centered, trauma-informed, and Housing First practices will help advance our work. These three best practices must be incorporated into mainstream programs, like ECFE. Topic presentations by experts in higher ed and the field will be followed by group discussion and sharing. The overall goal is to emphasize the importance of our work as family professionals, and to generate and learn new strategies for effective, high-quality work with families and with each other. The audience for this event is leaders and practitioners from a variety of fields that work with parents and families. Together, we will lead, learn, and build in order better meet the needs of practitioners and leaders who work with families. The 2019 Parenting Education Symposium is designed to be an engaging, productive forum where participants learn, discuss, and share ideas and suggestions for the effectively meeting the needs of children and families who have experienced trauma, particularly homelessness. Learn about homelessness in Minnesota and how it impacts children and families. Learn about and discuss Heading Home Together: Minnesota’s 2018-2020 Action Plan to Prevent and End Homelessness. Learn about and discuss strategies for working with families who have experienced, or are experiencing, trauma, particularly homelessness. Discuss and learn about the work currently being done, available resources, and models of collaboration. $15 registration fee provides lunch, and helps support space rental fee. See Homelessness page on this website. Do you work with families/parents in some capacity? Do you teach or supervise those who work with families? Is your work intended to impact/benefit families and their children? Do you advocate on behalf of families? If you answered "yes" to any of these questions, then you will want to consider participating in the symposium. Just as raising a child takes a village, so does supporting families and helping improve circumstances for families. The symposia always seeks diverse participation and representation, including systems (e.g., education, human services, health care, justice/corrections, etc. ), programs (e.g., child care, community-based, ECFE, Head Start, Title I), and services (e.g., home visiting, early childhood screening, court-ordered parents, etc.) with the goal of building and enhancing human and social capital among family professionals. collaborative, and focused efforts. The symposium itself is built on human and social capital, where participants engage and connect in order to work on problems and towards solutions. It is focused on action and outcomes, with the goal of building capacity. January 10, 2019, 9:30-3:30 at the University of Minnesota, St. Paul Student Center, North Star Ballroom. Space is limited, see registration tab above. Click Here for more information about the Student Center, including parking options. Symposium theme is "Lead. Learn. Build." If we are going to create great systems for families, we need to focus on leadership, learning, and building. Lead learners model making growth a priority and lead capacity building. Those who work with parents and families understand that lifelong learning is an essential part of our profession. This includes such things as learning about ourselves, learning about families, and learning from others. Caring and effective family professionals are committed to learning, reflecting, growing, and continually improving. Leaders build systems. They empower and build others. They help build opportunities. Have the opportunity to learn from others who have specialized knowledge and skills. Actively engage in discussion and planning. Network and collaborate with other professionals who work with families or have expertise in families. 10:50 - Promoting Resilience for Young Children in Families Experiencing Homelessness - Ann Masten, Ph.D.
Q: How many people are you expecting to attend? A: The conference room can accommodate over 250. Prior to January 10, we will let you know final registration numbers. Q: How will the room be set up? A: Round table arrangement with seating for 7-8 per table. Q: Who is the audience? A: We are hoping professionals from a variety of backgrounds and professions will register. For example, Head Start, health care, public health, ECFE, K-12, child care, community-based organizations, higher education, etc. Since space is limited, it is hoped that leaders are able to represent various fields. In short, the audience will be people who work with parents/families providing some type of education and professionals who teach/train those who work with parents/families. It is likely that the majority of participants will be from Early Childhood Family Education (ECFE) programs. See the "Participants" tab for a list of past participants (organizations represented). Q: How long are presentations? A: To be negotiated with event organizers. Presenters can determine what they want to convey to the audience in this time period. After each presentation, we will have time for discussion and group work. Q: What are family professionals and parenting educators? A: We are using a broad definition of parenting education (a professional who provides some type of education related to parenting/family life). This ranges from those who do family engagement in schools, to health care providers who work with parenting issues, to those who provide intensive parenting interventions. Family professionals, also broadly defined, are those whose profession includes working with families. 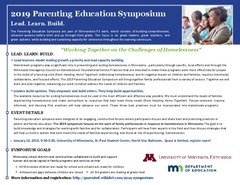 June 8, 2017, Parenting Education Symposium, highlight promising parent and family education programs and initiatives in Minnesota. Professionals from the organizations below have registered and/or participated in one or more of the Parenting Education/Family Engagement professional learning series opportunities. Blueprints for Healthy Youth Development provides a registry of evidence-based positive youth development programs designed to promote the health and well-being of children and teens. Dr. Helen Kim talks about the effects of historical trauma and structural racism in Minnesota.